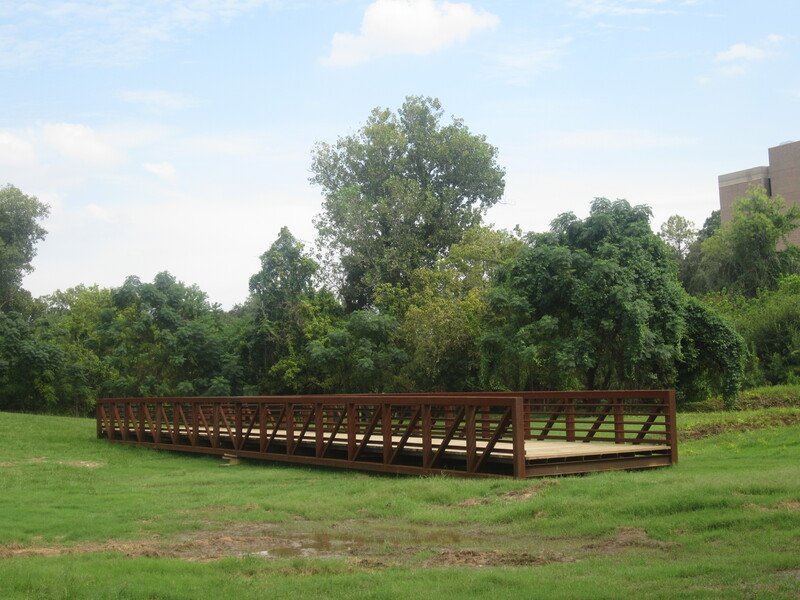 I was walking along Buffalo Bayou in Houston a few days ago and I came across this bridge to nowhere that you see above. This bridge is part of improvements along Buffalo Bayou for the benefit of the people of Houston and whoever else might be in town. Here are some of the specifics for the area where I saw the bridge-in-waiting. This is an area not far from Downtown. Improvements and the construction of new park space along the Houston’s Bayous is taking place all over Houston. This is something that is not just taking place proximate to Downtown. There are things that do get better even in hard times. 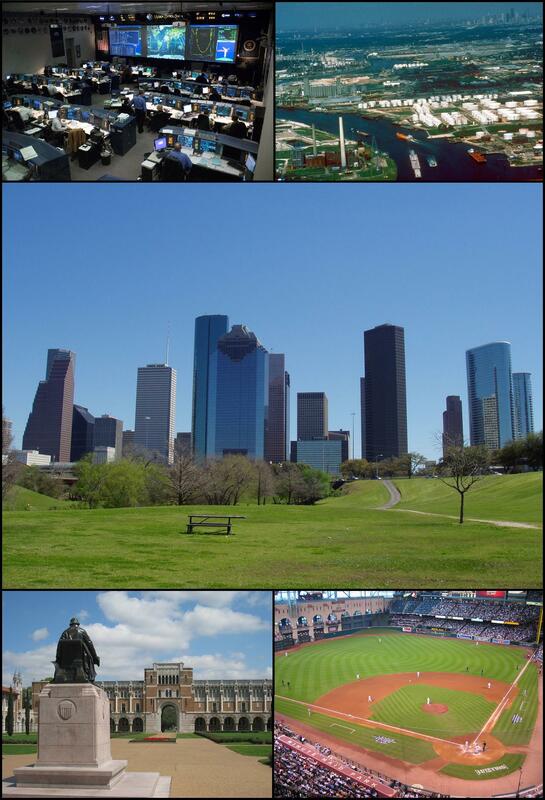 I’d ask Houstonians to check out some of the links above and to make use of the new parks. I’ve walked along a number of the new spaces and they are very well-done. Government often does make a positive and hopeful difference in people’s lives. The bridge above in a state of becoming—Just as we all are. Here is a sign I saw yesterday that opposes Cincinnati Public School taxes. 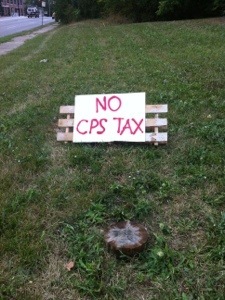 I don’t know if the sign is against all CPS taxes or just against an upcoming levy. It looks like a homemade or hand made sign. It did occur to me though that a superpac opposes these taxes and commissioned 5000 of these signs to give the impression of a grassroots revolt. My theory is dented by the fact that this is the only such sign I’ve seen so far. Though maybe it is just that this is the first of the 5000 signs. Where are boats in the Bolivar Ferry fleet sent when they need maintenance or repairs? 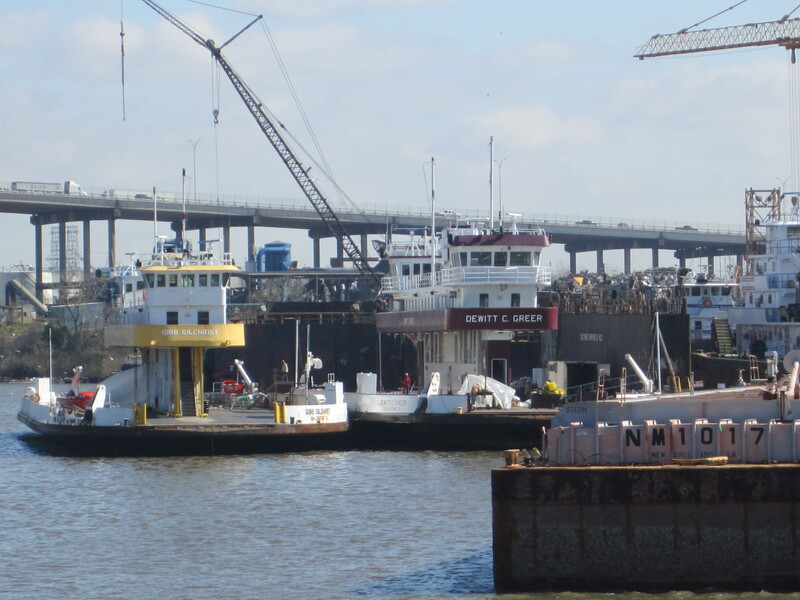 From the picture above that I took last week, I’d say they go to a boat repair yard in the Houston Ship Channel. Above you see the Bolivar Ferry called the Gibb Gilchrist in a boat repair yard in Houston Ship Channel. The Gilchrist is the yellow boat in the middle of the picture. The Bolivar Ferry runs from Galveston Island to Bolivar Peninsula. It is a “free” service run by the Texas Department of Transportation. Where are the cries of socialism? I thought a real Texan could cross a few miles of Galveston Bay on his or her own and without help from a meddling government. Where are the citizen-volunteers to fix the boat, instead of the tab taxpayers are no doubt picking up for whatever work is being done? Here are facts about who Gibb Gilchrist was from the excellent Handbook of Texas Online. The upshot is that Mr. Gilchrist was once President of Texas A & M.
The Bolivar Ferry is a great ride. You can walk on and take a round-trip that will run about 50 minutes. You’ll see big ships and you might see some dolphins. While you are riding the Bolivar Ferry, you are using a taxpayer-provided government service that enhances the common good. There will be a Good Jobs Great Houston march and protest against the failure of U.S. corporations to pay a fair share of the taxes in our great nation. The Government Accountability Office said 72 percent of all foreign corporations and about 57 percent of U.S. companies doing business in the United States paid no federal income taxes for at least one year between 1998 and 2005. More than half of foreign companies and about 42 percent of U.S. companies paid no U.S. income taxes for two or more years in that period, the report said. During that time corporate sales in the United States totaled $2.5 trillion, according to Democratic Sens. Carl Levin of Michigan and Byron Dorgan of North Dakota, who requested the GAO study. Here are detail of the Jan. 24 march. FACT: You have more money in your pocket than a majority of US corporations paid in federal income taxes last year. FACT: Several of these corporations are headquartered downtown. FACT: While these corporations dodge paying their fair share of taxes, we’re the ones getting cut and fired. What’s wrong with this picture? Join us at the reflecting pool in front of Houston City Hall on Tuesday, January 24 at 1:30 PM, where we’ll go hog wild and march to some of these corporate HQs downtown to tell them to pay their share! 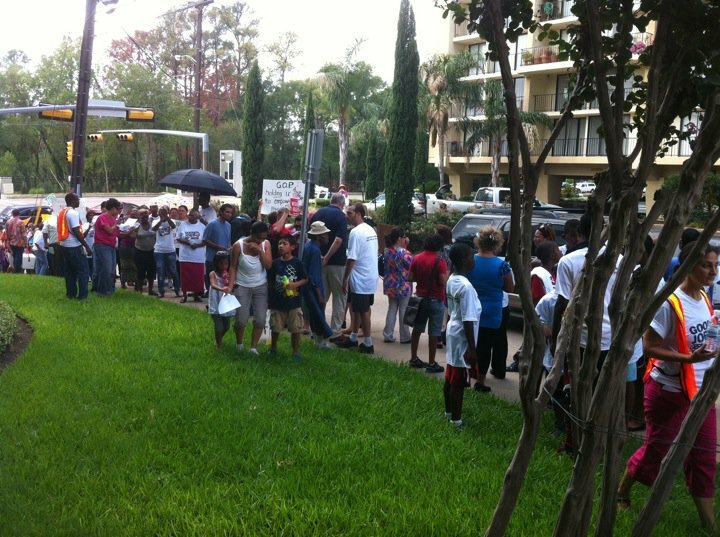 The good Americans you see in the picture above were protesting today outside the Houston office of Republican U.S. Senator John Cornyn. These loyal Americans were demanding tax increases for the most wealthy, good jobs, and a federal budget that invests in America. They were out protesting because they know that the work of freedom is up to each of us. Our Tea Party/Republican Party foes never rest in helping the rich get richer, and in making sure that hard honest work does not pay off for everyday Americans. 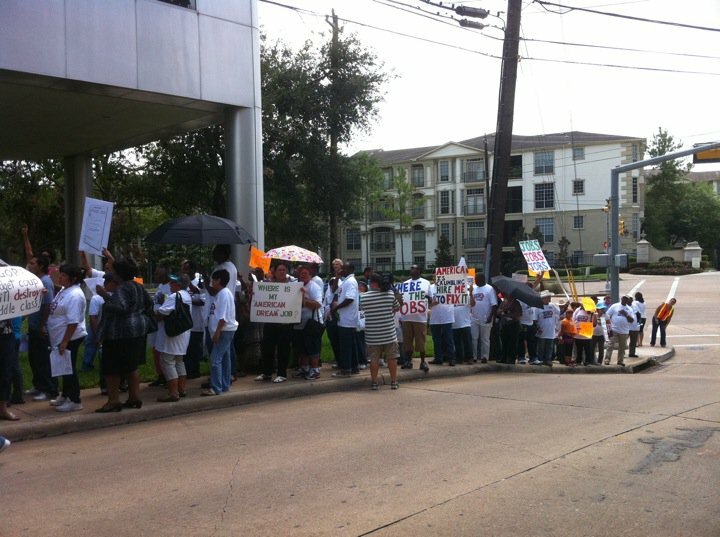 These protestors were part of the Good Jobs=Great Houston Coalition. Here are the member groups as of so far in the Good Jobs coalition. You can click on the logo of each group to learn more about what they do. It is up to each of us to be involved in our future. Every Texan and every American has the ability to attend a public meeting, attend or organize a protest, write or call an elected official, talk to friends and family, start a blog, donate money, write a letter to the editor, volunteer for candidates and causes, engage in acts of civil disobedience, and even run for public office. Bolivar Ferry In The Houston Ship Channel—How About A Tea Party Citizen-Navy? 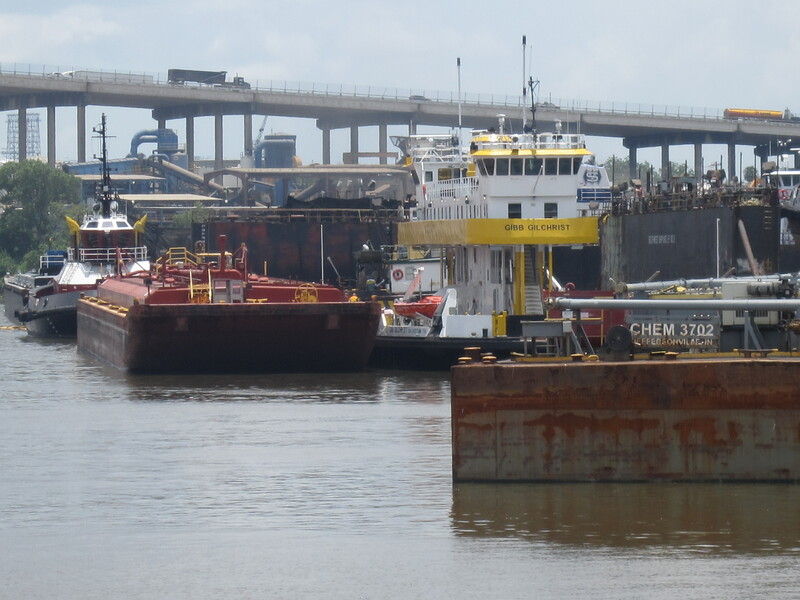 When the boats that are part of the Bolivar Ferry service need some repairs or a tune-up, it seems that they are taken to the spot you see above in the Houston Ship Channel. The red boat and the yellow boat in the picture are each part of the Bolivar Ferry. The Bolivar Ferry is a free government service offered by the State of Texas that takes folks between Galveston Island and Bolivar Peninsula. The Bolivar Chamber of Commerce has no objections at all to this subsidy. The Houston Ship Channel receives all sorts of government funds to stay up and running. I’m not aware of any large industrial concerns complaining about socialism at the Houston Ship Channel. Maybe Tea Party cells and small government advocates could muster up volunteer crews to run the ferry and to operate the Houston Ship Channel. Surely the Tea Party has considered raising a citizen-volunteer navy to go along with all the talk of citizen militias and defending freedom. For the first time ever, a space probe is orbiting the planet Mercury. 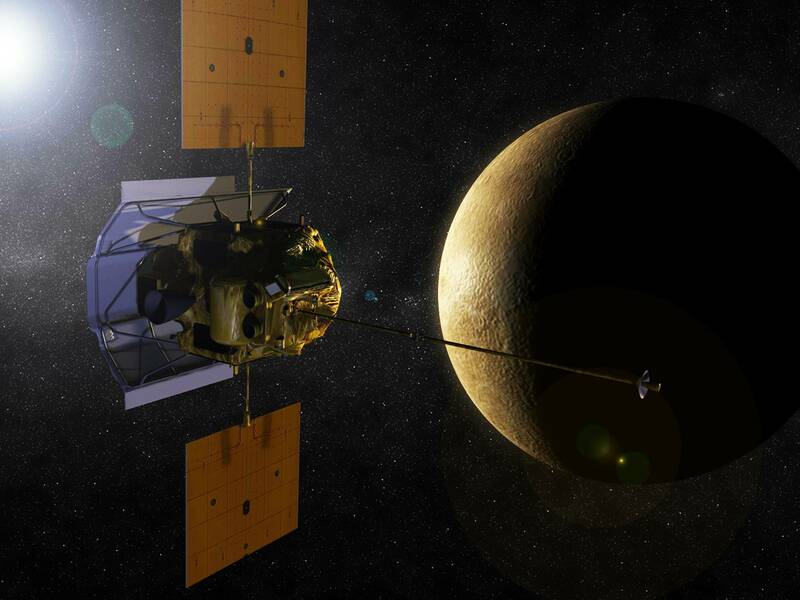 The name of the probe is Messenger. 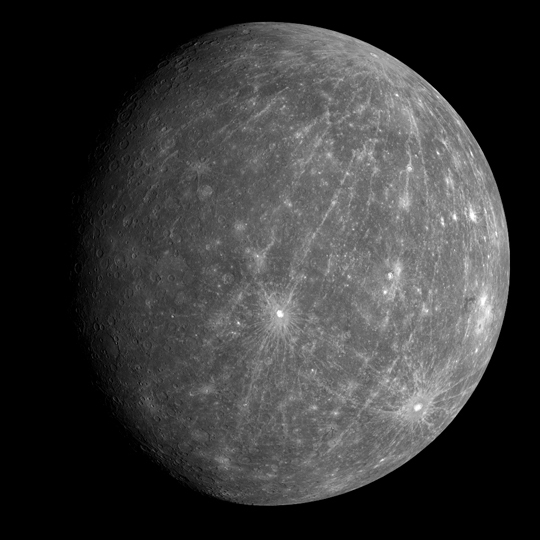 Messenger is sending data and pictures back to Earth about conditions on Mercury. If Messenger is sending messages to beings on Mercury, I’m sorry to the great degree that this blog post is missing the real story. Here is the NASA home page for Messenger. Here is how the BBC reported Messenger reaching Mercury’s orbit. I’m glad I live in a time where we’ve been able to learn about the planets in our solar system. Even more amazing, we’ve been learning about planets outside our solar system. I never thought that would be possible in my lifetime. If intelligent aliens exist on these distant planets, I implore them to stay away. They will bring terrible diseases. They will enslave us. They will steal our oceans. What is it like on Mercury? Mercury is a terrible place. At least it is in the context of human existence. I imagine that in the full scheme of existence, Mercury is just like it needs to be. Below is a picture of Mercury sent from Messenger. A book about the solar system I enjoy is called The Grand Tour–A Traveler’s Guide To The Solar System by Ron Miller and William Hartmann. Grand Tour has many pictures, drawings and facts about all aspects of our solar system. The book is currently in a third edition. Here is the National Geographic page on the Solar System. Some people say government should only pertain to the most minimal functions. Yet it is only government that could fund missions to understand distant space. There are no minerals on Mercury that we will be mining from private profit. There are no advertising jingles that Messenger will be sending from Mercury. There is so much to learn about existence. There is so much context to understand as we consider our views about the world. Every person has the ability to learn about any subject. Take the time it requires to learn about our world. The more we learn, the better we will understand all that is taking place. Above is a picture I took two days ago in Cincinnati’s Eden Park. Look at all the ways government intrudes in our lives. Government tells us we are at the corner of Alpine and St. Paul. Maybe we feel we are someplace else. The government just wants us to think we are at the corner of Alpine and St. Paul. Government tells us this is a one way street. What about hard-working, English-speaking, tax-paying Americans who want to go another way down this street? First they tell us what we can do in our very own cars. Next they will harvest our organs for a United Nations organ bank. The government wants us to stop at a certain place on the road. What if this is not the place we wish to stop? Should not free citizens be able to employ their superior knowledge of traffic management to know just the right place where they should stop? 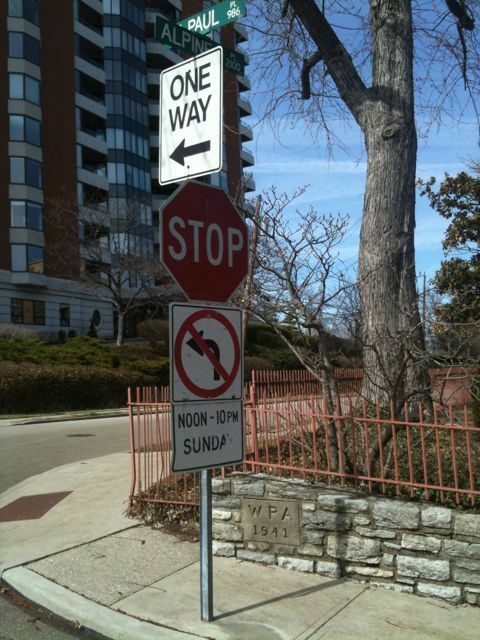 Government says we can not turn left between noon and ten on Sunday. Where is that restriction in the Constitution? Sunday is the sabbath. What if God directs me to turn left at Alpine and St. Paul in the middle of the afternoon on a Sunday? If you look at the top of the stone wall near the pole of the traffic sign, you see that the stone wall was built by the New Deal Works Progress Administration in 1941. When will the Cincinnati Tea Party come to tear down this wall and build a new one with citizen-volunteer labor? How have the people of Cincnnati allowed this socialism to stand in clear view for 70 years? When will government get out of our lives? 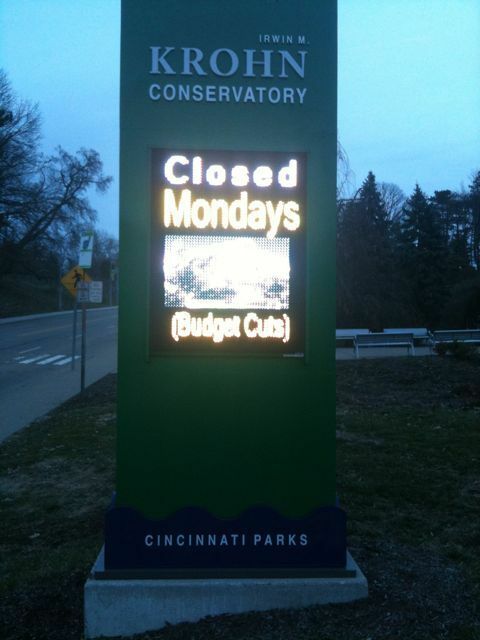 Popular Krohn Conservatory Closed On Mondays—Who Needs Any Good Cheer On A Monday? Want to see all the exotic plants at Cincinnati’s popular Krohn Conservatory? Looking for a few minutes out of the cold in the dark of winter by visiting the Krohn? You’d better hope it is not Monday. Who needs a morale boost on a Monday? Folks spend all weekend looking forward to Monday. It is limited resources for all except when it comes to corporate profits. People need to decide what kind of future they want to have in this nation. If you don’t get involved and fight back, the things we all count on from government will go away, and your future will have no value but the profit you can make for others. Due in large part to Republican mismanagement of state finances, and due to the failure of many ordinary Texans to meet the everyday obligations of citizenship, the State of Texas faces a massive budget deficit. State Comptroller Susan Combs says the deficit could possible be as high as $27 billion for the 2012-2013 biennium. 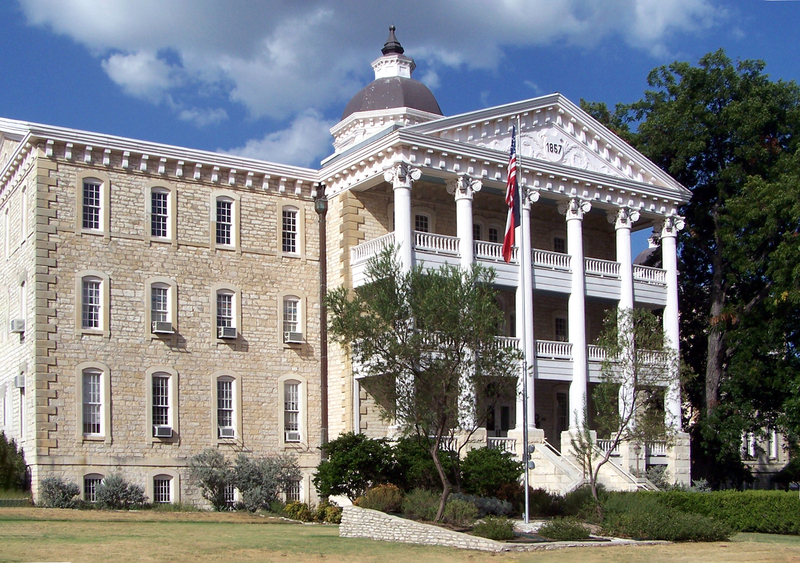 The Texas Legislature, now in session, will have to approve a budget for 2012 and 2013. There are many reasons for this budget shortfall. Some of them have nothing to do with anything in the control of Texas. The national recession has hit states hard across the nation. However, property tax cuts we could not afford and a Republican ideology of small government and low taxes no matter what, has also put us in this tough spot. Will states rights and reflexive bashing of Washington help your kid compete with kids from India and China? Will it help you when you are sick and need help? Will Governor Perry declaring divisive Voter ID bills for non-existent voter fraud and sanctuary city legislation an “emergency” help anybody? People in our state need to make the call that they are going to demand a focus on things that matter, and that they will not allow themselves to be distracted by sideshows. We need to be clear. Republicans have been in firm control of Texas for many years now. We have had a Republican Governor since 1995. Republicans have long been in control of both Houses of the Texas Legislature. Republicans would have you believe that only states run by Democrats face these types of deficit problems. However, because we are not powerless as free citizens, this problem is also on average Texans who have enjoyed low taxes even as our state has failed on so many measures of education and public health. Texas is 43rd of the 50 states in overall tax burden. And, of course, we have millions of Texans who can’t even be bothered to vote in most elections. This combination of a bad national economy, a destructive ideology, low taxes, and a short-sighted public has real consequences. Even a Republican State Senator is upset. In Ector County, Odessa College, a community college, has been targeted for zero funding. This has angered people in this area. Ector County voted more than 3 to 1 for Rick Perry in 2010. What did people in Ector County think they were voting for last November? I thought personal responsibility for your actions is what Texas is all about. By that measure, cuts in services of all kinds in Ector County should rightly be deep and brutal. People are, of course, free to sacrifice their futures and the futures of their children to lost cause of states rights. They are free to value low taxes over anything else. However, there are people in Texas who take the position that the future has value. The Legislative Study Group, a forward-thinking caucus of the Texas House chaired by Houston area State Rep. Garnet Coleman, has issued a document detailing what the budget proposed by the Texas House will mean for Texans. Review this document and see the impact these cuts will have on all Texans. The Texas-based Center for Public Policy Priorities (CPPP) has produced a document that provides Texans the facts on how to be involved in the budget process. The CPPP is a good resource for Texans who believe our state is about more than just looking out for those who are already doing well. Texas political blogs such as Capitol Annex, The Daily Hurricane, Brains And Eggs, Jobsanger, Letters From Texas, Bay Area Houston, and Off The Kuff are also reporting on the deficit and on hopeful alternatives for Texas. These citizen bloggers reflect the best aspirations of Texas. It is up to each individual Texan to fight back. This is the ethos of Texas. We must take responsibility for our lives and for our state. The extreme right-wing ideology of the Republican Party in Texas, which even goes so far as to talk about seccession from the union, does not provide any realistic vision of the part that Texas must play in the global economy. No matter what we have been fed over the years in Texas, we don’t have to live selfish lives. We can care for the people around us and still be good Texans. Houston Mayor Annise Parker has ordered mandatory furloughs for some City of Houston employees. It is important to note that Mayor Parker exempted city employees at the lowest end of the pay scale. In a time when recession has caused many to go after the poorest first, while making sure that tax cuts for the rich stay in place, it is good to see acknowledgment of the needs of the people hurting most from these hard times. Bashing public employees is all the rage in our nation at the moment. Are public employees the cause of unsustainable deficit-boosting tax cuts that we have seen at so many levels of government in recent years? Public employees must accept some of the pain of the recession. People taking a public paycheck at any level of government must lead by example. These sacrifices to be made by public employees must also apply to police officers and firefighters. Health and retirement benefits that are a critical longterm cost to governmentt must be on the table for some reconsideration. There is nothing wrong with looking at all aspects of government spending when times are hard– Or, for that matter, at any point. Yet at the same time, nothing is achieved by allowing Republican politicians to stoke resentment of fellow working people while at the same time they do all they can to protect tax cuts for the rich. What these Republicans really wish to do is outsource government services to politically connected firms, so that everybody but the people who actually do the work will get the taxpayer dollars. If you are an average working person going on about a garbage man making 30k or 40K a year, while you vote for politicians who fight for tax cuts for millionaires, you must be smoking some pretty heavy dope. Don’t we have any remaining capacity for self-respect as fellow working people, and as members of a society? Must we allow ourselves to be used to get at others not so unlike ourselves? Here in Houston, the overwhelming number people skip voting in municipal elections, and there have been a number of city property tax cuts in recent years. It is time for citizens of Houston, and of our nation, to take stock of the public obligations that we all should share. In addition to leadership from the Mayor and city employees on these budget questions in Houston, tax increases and sacrifices from average citizens may also need to be part of the solution. Top Texas blogger Charles Kuffner has also posted on this subject. Where Are Republican Objections To Federal Dollars For Galveston Seawall Improvements?—Where Are Seawall Bake Sales And The Citizen Volunteers? The people of Galveston County will be enjoying the benefits of federal dollars as the federal government will be picking up most of the expense for $15 million in improvements to the Galveston Seawall. In 2010, the voters of Galveston County elected a Republican county government. I thought the message of the 2010 election was to get government out of our lives. 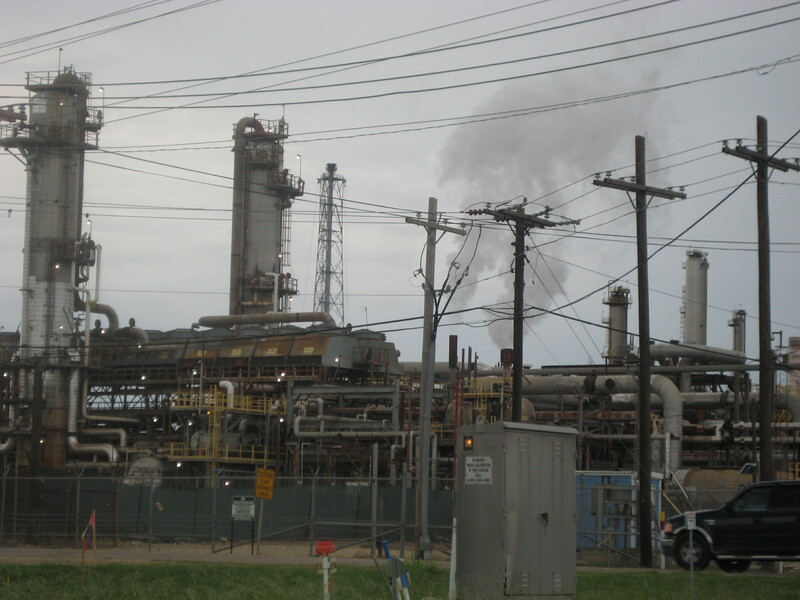 Where are the objections to this project from Galveston County Republicans? Where are the Republicans of principle holding bake sales to raise funds for Seawall improvements? Where are the citizens forming volunteer parties to do this work without federal intrusion from Washington? People can go on and on about government. But in the end, they take the money. There is nothing wrong with taking the money for useful projects such as improving a resource as vital to the safety and prosperity of Galveston County as is the Seawall. Also, there is nothing wrong with realizing the fact that government has a role to play in our lives. Wherever in the country you live, you can bet that folks who complain about government are taking government dollars for needed and helpful reasons. We should be proud of the fact that we live in a civilized nation where funds are raised and people are helped for the good of the general welfare. 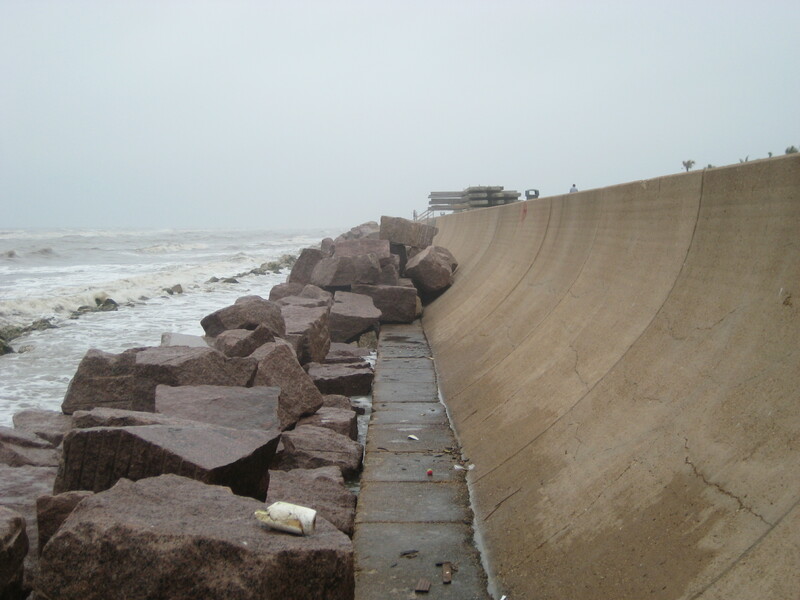 Here is some history of the Galveston Seawall. What does Republican Governor-elect John Kasich of Ohio want? Federal money for Ohio is what Republican Governor-elect John Kasich of Ohio wants. Mr. Kasich wants money for freight rail instead of for passenger lines. Where is his call for free enterprise for freight rail? Must Ohio’s freight rail industry be burdened by socialism? Where are the freight rail executives in opposing this socialism? Mr. Kasich wants job training, Title I, and Medicaid money. Where is all the Tea Party/Republican talk about the federal government staying away? Mr. Kasich says the federal government denies him flexibility in how federal money will be spent. Yet Ohio will still get the Race To The Top money despite the change in Ohio from a Democratic Governor to a Republican Governor. What a bunch of hypocrisy is so many respects from Mr. Kasich and from the Republican Party in Ohio. I lived in Ohio for 18 years and I go back to Ohio twice each year. 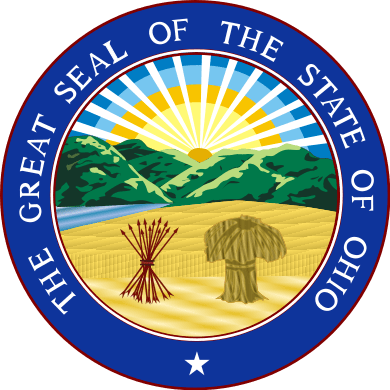 “You can elect every government-bashing Republican you want, but in the end the federal government and government in general has a role to play in helping Ohio. Your new Republican Governor is tripping over himself looking for federal money. He is going to the White House and asking Barack Obama and Joe Biden for federal money. Mr. Kasich is doing this because the reality is that government is a needed part of life and because private industry, while essential, can’t meet all the requirements of our lives. This is what I would say to my fellow Ohioans.